ALAN 1. 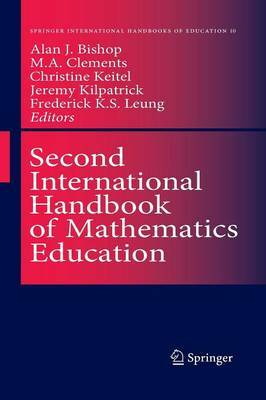 BISHOP The first International Handbook on Mathematics Education was published by Kluwer Academic Publishers in 1996. However, most of the writing for that handbook was done in 1995 and generally reflected the main research and development foci prior to 1994. There were four sections, 36 chapters, and some 150 people contributed to the final volume either as author, reviewer, editor, or critical friend. The task was a monumental one, attempting to cover the major research and practice developments in the international field of mathematics education as it appeared to the contributors in 1995. Inevitably there were certain omissions, some developments were only starting to emerge, and some literatures were only sketchy and speculative. However that Handbook has had to be reprinted three times, so it clearly fulfilled a need and I personally hope that it lived up to what I wrote in its Introduction: The Handbook thus attempts not merely to present a description of the international 'state-of-the-field', but also to offer synthetic and reflective overviews on the different directions being taken by the field, on the gaps existing in our present knowledge, on the current problems being faced, and on the future possibilities for development. (Bishop et aI. , 1996) Since that time there has been even more activity in our field, and now seems a good time to take stock again, to reflect on what has happened since 1995, and to create a second Handbook with the same overall goals.